Giveaway dose: Tips for Styling Casual Dresses During Winter Months. Tips for Styling Casual Dresses During Winter Months. Don’t move those dresses to the back of your closets just yet! You can still rock your frocks through the winter months with a few strategic tips for staying warm and stylish. For this post, we’re going to look at a few super-cute casual dresses from Lyst's collection and then offer some helpful ideas on how to style them. The best part is that you probably already have most of these accessories in your closets. And if not, then it’s a perfect excuse for a shopping trip! The oversized midi check shirt dress in red from Missguided shown above is the perfect casual dress for layering during the fall and winter months. First and foremost, the flannel plaid pattern is completely on trend and the red and black colors are perfect for the season. Adding a pair of boots is a great start, but don’t forget the tights! A pair of black leggings or tights would look great and serve double duty by keeping your legs warm, too. 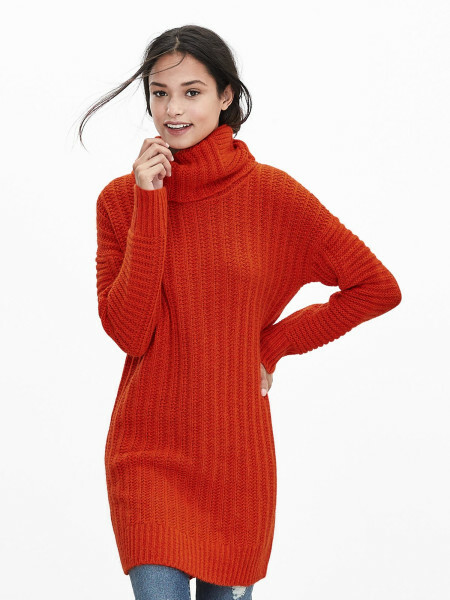 And if it’s really cold, a long sleeve black turtleneck tucked beneath this dress plus a slouchy knit hat would be perfect finishing touches. The form-fitting, black-and-white striped midi dress from ASOS shown above is, according to Vogue, one of the hottest neutral combinations from the runways this season. Black and white is everywhere and it’s a great way to get the most out of your wardrobe thanks to its ability to go with just about anything. When wearing this or a similar dress, you can have fun with a playful pop of color. After you slip on your black leggings, wrap your neck and shoulders in a magenta scarf, and cinch your waist with an earth-toned belt to go with your matching boots. Cap it off with your favorite motorcycle jacket or coat for extra warmth and style. The comfy and cozy red funnel sweater dress from Banana Republic shown above has all of the components for a timeless winter dress, as noted by Harper’s Bazaar , and I agree! This red hue with a touch of orange is the perfect bold color for fall and winter. This thigh grazing dress is already warm, but with a few extra accessories you can be winter-weather ready. Earth-toned knee-high boots and brown leggings would look great, but for an unexpected touch, pair it with distressed skinny jeans and booties. Scarves look great with turtlenecks—spring for a patterned piece for more interest and don’t forget your hat. Dresses don’t have to be dismissed during the colder months. In fact, they are the perfect excuses for layering and having some unexpected fun with your wardrobe. Leggings, patterned tights, jeans, knee-high boots, wedge booties, and flats are great ways to accessorize your bottom half, while belts, scarves, long sleeve layering shirts, jackets, and hats are the answer for staying toasty up top. These are all fabulous ideas. I have a dress like the second one...I'm going to have to replicate this look. Thanks for sharing! great tips. I will make sure to put them in to use.